Price Of Many ACA Health Policies Has Dropped Since Last Year : Shots - Health News After years of price hikes, the cost of the average Affordable Care Act policy is dropping across the U.S. Competition among insurers has increased as the political uncertainty starts to settle down. 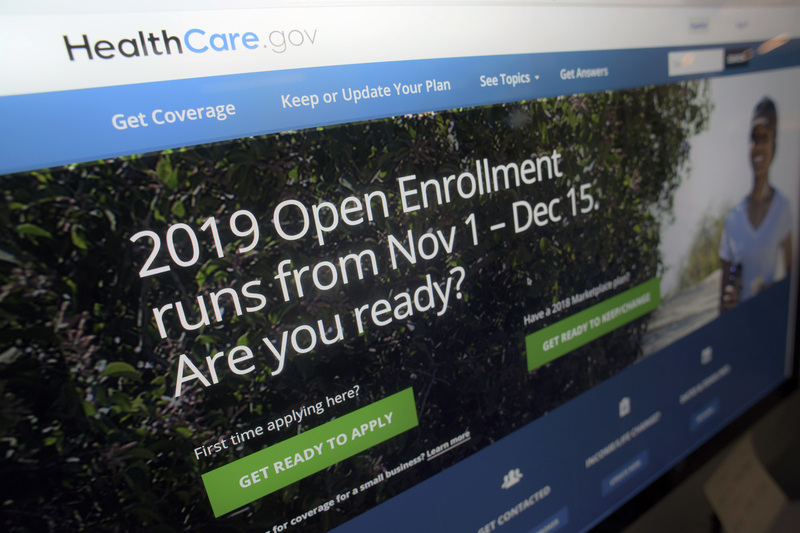 More than half of all counties in the 39 states that rely on the federal HealthCare.gov exchange for ACA health insurance are experiencing a 10 percent price decrease, on average, for their cheapest plan for 2019. And four insurers are now selling ACA policies in Phoenix. That's the same market that then-presidential candidate Donald Trump highlighted in 2016 because all but one insurer had left the region — he called it proof of "the madness of Obamacare." Janice Johnson, a 63-year-old retiree in Arizona's Maricopa County, which includes Phoenix, said her monthly premium for a high-deductible bronze plan will be $207 for 2019, instead of $270, because she is switching carriers. "When you're on a fixed income, that makes a difference," said Johnson, who receives a government subsidy to help cover her premium. "I'll know more in a year from now if I'm going to stick with this company. But I'm going to give them a chance, and I'm pretty excited by that." In most places, the declines are not enough to erase the price hikes that have accrued since the creation of the health care exchanges in 2014. Instead, next year's price cuts help to correct the huge increases that jittery insurers set for 2018 to protect themselves from anticipated Republican assaults on the markets. While Congress came up one vote shy of repealing the federal health law in the summer of 2017, Trump and Republicans in Congress did manage to strip away many of the structural underpinnings that induced people to buy plans and helped insurers pay for some of their low-income customers' copayments and deductibles. Insurers responded with a 32 percent increase, on average, for 2018 plans. When Republicans failed to kill the health law last year, they inadvertently may have made it stronger. Insurers banked hefty profits in 2018, and that attracted new companies to most ACA markets. All these factors were especially influential in Tennessee, where the average benchmark premium is dropping 26 percent, according to an analysis by the federal government. That's a bigger drop than in any other state. Seventy-eight of 95 Tennessee counties had just one insurer for 2018. That monopoly allowed the insurer to set the prices of its plans without fear of competition, said David Anderson, a researcher at the Duke-Margolis Center for Health Policy in Durham, N.C. "They were massively overpriced," Anderson said of all available policies. But for the coming year, 49 Tennessee counties will have more than one insurer, with a few — like Shelby County, where Memphis is located — having four companies competing. There, Cigna dropped the price of its lowest-cost silver plan by 15 percent. Even then, Cigna was underbid by Ambetter of Tennessee, a company owned by the managed-care insurer Centene Corp.
"We're finally at the point where the market is stabilized," said Bobby Huffaker, the CEO of American Exchange, an insurance brokerage firm based in Tennessee. "From the beginning, every underwriter — [and] the people who were the architects — they knew it would take several years for the market to mature." Still, the cheapest Memphis silver premium is nearly three times what it was in 2014, the first year of the marketplaces. A family of four, headed by 40-year-old parents, will be paying $19,119 for all of next year unless they qualify for a government subsidy. The landscape in Phoenix is greatly improved from when Trump visited after the federal government announced a 116 percent premium increase for 2017; the number of insurers at that time had dropped from eight to one. Now, three new insurers are entering Maricopa County. Meanwhile, Ambetter, the only insurer that offered plans for 2018, reduced its lowest price for a silver plan for next year by 12 percent — and it offers the cheapest such plan in the market. Still, Ambetter's plan is 114 percent above the least expensive silver plan offered there in the first year of the exchanges. And neither Ambetter nor any of the insurers coming into the market for 2019 offer as broad and flexible a choice of doctors and hospitals as consumers had back then, according to Michael Malasnik, a local broker. Since the start of the exchanges, Malasnik said, insurers have "raised their rates by multiples, and they've figured out you have to be a very narrow network." Each plan in Phoenix for 2019 contains trade-offs, he said. Only Bright Health's plan includes Phoenix Children's Hospital. Ambetter's plan includes the most popular hospital and doctor groups, Malasnik said. But those providers are not as conveniently located for people living in the southeastern corner of the county, and that makes other insurers' plans more appealing for some customers. Theresa Flood, a preschool teacher who lives outside Phoenix, said none of the provider networks of the plans she considered included her doctors, such as the specialist who treats her spine problems. She has had four surgeries, and a neurologist who monitors a cyst and benign tumor in her brain is also outside the network she ended up choosing. "I have to establish care with a whole new spine doctor and establish care with a whole new neurologist if I want to follow up on these things," said Flood, who is 59. "You're going from 'established care' to 'who in the heck am I going to see?' "
The plan Flood ultimately chose would have been too expensive, except that she and her husband John, who is a minister, qualified for a $1,263-a-month subsidy that will drop the cost to $207 a month. That bronze plan from Ambetter carries a $6,550-per-person deductible; so Flood expects she'll still have to pay out-of-pocket for her treatments and doctor visits unless she needs extensive medical attention.